The 26 percent approval rating is the highest Congress has had since 2017, soon after Donald Trump entered the White House and Republicans controlled the House and Senate. 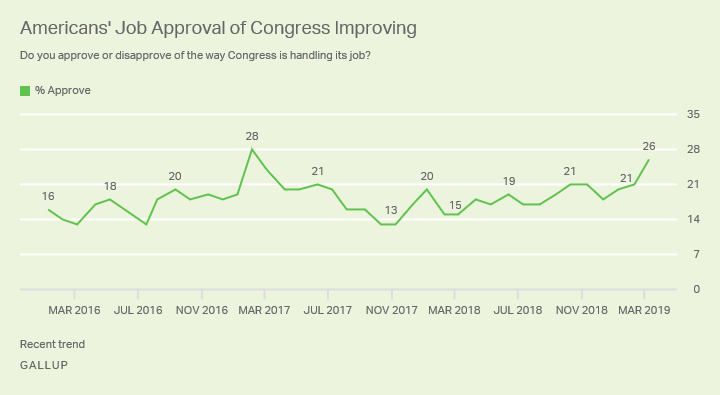 Congress generally doesn’t fare well when it comes to job approval ratings, but a new poll gives lawmakers their highest mark in two years. Keep in mind, the Gallup Poll found that the job approval rating is only 26 percent. That’s still an improvement — much better than the low of just 13 percent in November of 2017. The findings come from a survey released this week. Right now, Democrats are more likely than Republicans to approve of the work Congress is doing, by a margin of 30 percent to 18 percent. That’s not surprising, since Democrats were out of power for many years until they retook the House January. Results are based on telephone interviews conducted between March 1 and 10, 2019, according to the poll. A random sample of 1,039 adults was collected from all over the 50 states and D.C. The margin of sampling error is plus or minus 4 percent. The latest survey results are roughly in line with historical trends. Gallup said Congress has generally averaged about a 30 percent approval rating since 1974. The highest rating for Congress — by far — was right after the terror attacks of 9/11, when the approval rating soared to 84 percent.